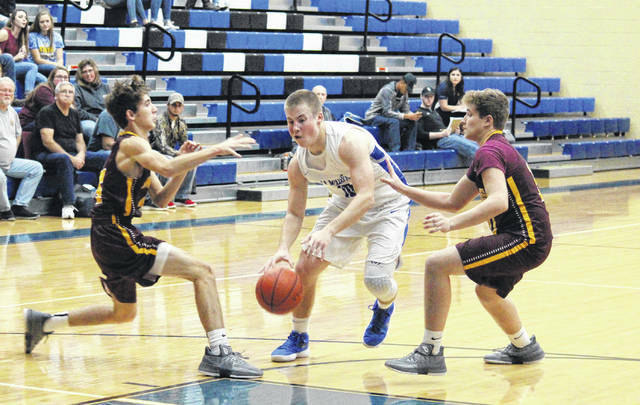 Gallia Academy junior Justin McClelland (center) drives in between Marauders Cole Betzing (left) and Nick Lilly (right), during the first half of the Blue Devils’ 59-37 victory on Tuesday in Centenary, Ohio. Meigs junior Zach Bartrum (15) shoots a layup over GAHS junior Caleb Henry, during Gallia Academy’s 59-37 win on Tuesday in Centenary, Ohio. CENTENARY, Ohio — Devils’ defense dazzles again. 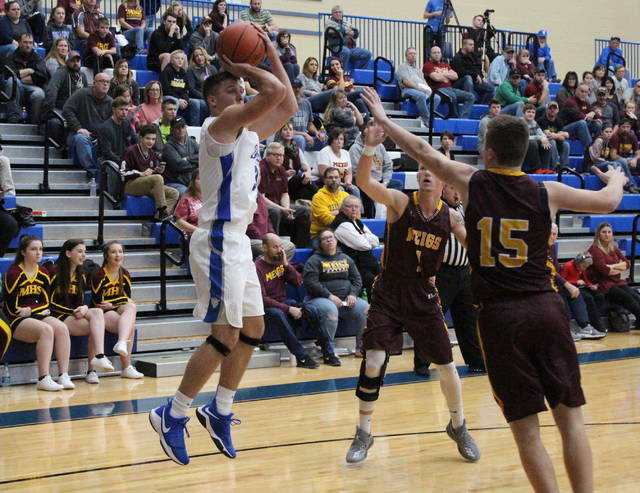 For the second straight game, the Gallia Academy boys basketball team held its opponent under 40 points, with the Blue Devils taking a 59-37 non-conference victory over visiting Meigs on Tuesday night in Gallia County. 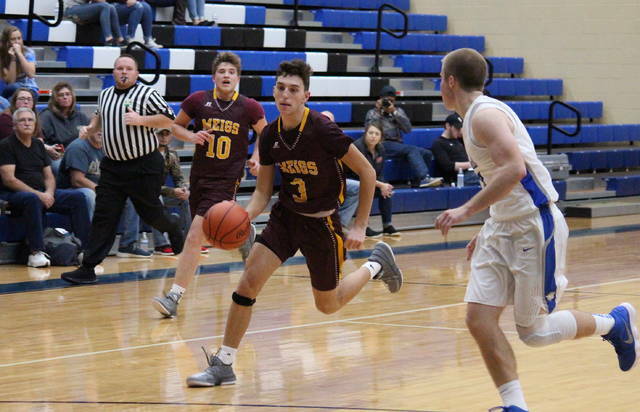 Gallia Academy (2-0) hit the game’s opening bucket, but Meigs (0-3) held its host off the board for the next three minutes, as the Marauders surged into a 5-3 lead. However, GAHS ended the first quarter with a 12-2 run and a 15-7 lead. 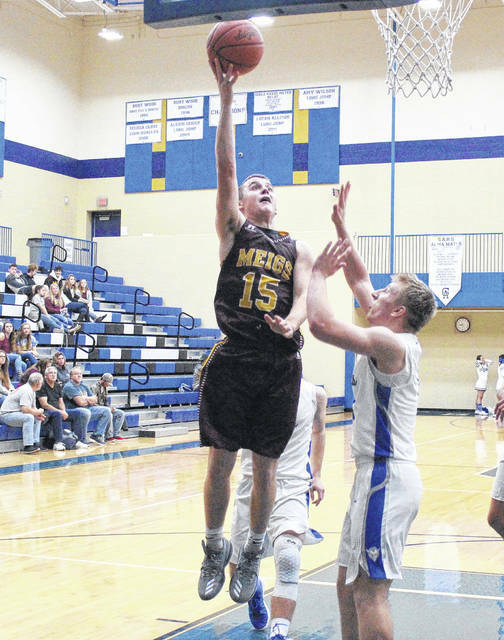 The Maroon and Gold outscored the Gallia Academy by a 9-6 count in the slow-paced second quarter, trimming the margin to 21-16 by halftime. MHS cut its deficit to as low as three points in the opening minute of the second half, but never got closer, as the Blue Devils extended their advantage to 36-23 by the end of the third quarter. GAHS expanded its lead throughout the finale, shooting over 50 percent from the field in the period to seal the 59-37 victory, with the 22-point final margin as the largest of the game. For the game, GAHS shot 21-of-65 (32.3 percent) from the field, including 6-of-20 (30 percent) from three-point range. Meanwhile, Meigs made 13-of-43 (30.2 percent) from the field, including 3-of-11 (27.3 percent) from deep. From the charity stripe, the Blue Devils shot 9-of-16 (56.3 percent), while the Marauders were 8-of-12 (66.7 percent). After being outrebounded by six in the first half, GAHS fought back to win the rebounding battle by a 37-to-26 count, including 13-to-4 on the offensive end. The Blue Devils also held advantages of 14-to-10 in assists, 5-to-4 in steals and 9-to-3 in blocked shots. The Blue and White committed a dozen turnovers in the win, while Meigs gave the ball away 15 times. Offensively, the Blue Devils were led by Evan Wiseman and Justin McClelland with 13 points apiece. Loveday, a sophomore, finished with a double-double of 12 points and 15 rebounds, to go with team-highs of five assists and six blocks for the hosts. Henry scored 11 points and pulled in seven rebounds in the triumph, while Logan Blouir chipped in with four points. Bailey Walker contributed three points to the winning cause, Kaden Thomas added two, while Cory Call came up with one. Baer led the way for Meigs with 13 points, followed by Bartrum with 11 points and six assists. Musser scored five points, hauled in six rebounds and blocked three shots for the Maroon and Gold, Cooper Darst added four points and a team-high 10 rebounds, while Nick Lilly scored three points and Mattox had one marker. The Marauders lost more than the game, as Mattox and Darst both left the game due to injury, in the first and second halves respectively. The Blue and White continue their home stand on Saturday against non-conference rival Jackson. Meigs continues non-league play on Friday at Warren and then will face Ironton on Saturday, as part of the 12th annual Newt Oliver Coaches Classic. This is the lone scheduled meeting between MHS and GAHS this season.